Facebook is upping its messaging game in a bid to win you over. 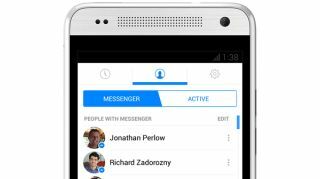 The social media site announced that staring today a select amount of Android devices will see a new Facebook Messenger system - one that is faster, easier on the eyes and best of all, provides more functions. Facebook's main aim is a better "mobile-to-mobile" system where it can stack up more competitively against other messaging clients like WhatsApp. The good news for FB is that it may actually succeed in this as the changes seem to drastically improve the Messenger experience. The biggest and perhaps best change is how Facebook Messenger now lets you use the system to text everyone you know, like that friend who refuses to give in and get Facebook. Confirming phone number seems to be the only obstacle to chatting with contacts. To make texting faster, the lightening bolt Messenger icon will let you know which friend is also using the mobile app, allowing messages to be sent and received instantly. The icing on the cake is the new color scheme attached to the revamped app - Messenger is now dressed up in a new blue hue to help you better differentiate between Facebook apps. TechRadar asked the social networking giant for info on a wider release for more devices, but we were told the app is being tested with a limited amount of people with it coming to "everyone on iOS and Android in the coming weeks."